Action Alert: the fight against cuts to jobs and services will continue to rage as the legislature prepares for an extended session. Attend the next SOS meeting to help decide the community response. The message must be loud and clear: protect state workers and the most vulnerable. 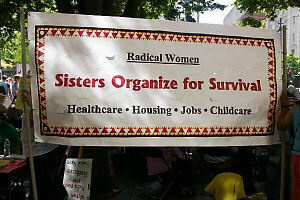 Come to the next meeting of Sisters Organize for Survival. Thursday, April 28, 7pm in New Freeway Hall, 5018 Rainier Ave S.
The state Senate passed a bill forcing schools to adopt a statewide teacher layoff policy that ignores local needs, eliminates local decision-making and links layoffs to evaluations. The Senate voted to amend HB 1443, adding language teachers and other educators adamantly oppose. Just like the earlier versions of the teacher termination/layoff bills, the amended HB 1443 does nothing to prevent teachers from being laid off, and it forces school districts to adopt one-size-fits all approach to school staffing decisions, overriding local decision making and the role of locally elected school boards. The amended HB 1443 sends teacher salary issues to the Compensation Work Group which begins this summer. The group is directed to review the teacher salary allocation model and overall compensation system, including experience, education and teacher evaluations, in addition to cutting teacher pay in school districts with grand fathered salary schedules. This is a direct attack on the collective bargaining rights of the teachers union. Several Democrats joined all Senate Republicans in supporting the amended bill. The fight against cuts to jobs and services will continue to rage as the legislature prepares for an extended session. Attend the next SOS meeting to help decide the community response. The message must be loud and clear: protect state workers and the most vulnerable! 4 blocks south of S. Alaska St. at the S. Edmunds St. stop of the #7 busline or six blocks southeast of the Columbia City light rail station.